When working with newly installed wood and decking surfaces, the Restore-A-Deck Wood Stain is ideal after 3-6 months of natural weathering. 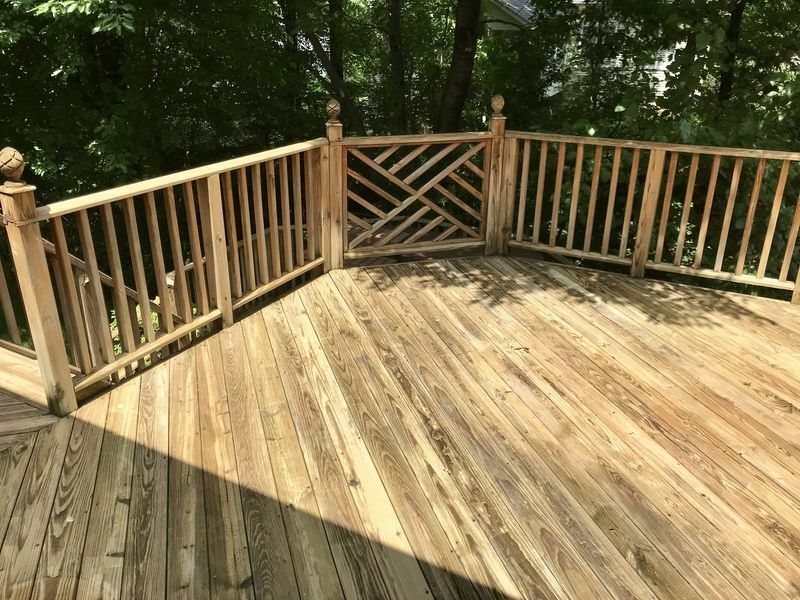 Restore-A-Deck Wood Stain’s long-lasting composition works hard to absorb quickly and penetrate deep into the wood grain to withstand the elements and stay true to its beautiful finish long after the staining project is complete. Before beginning the staining process, it is recommended that new wood surfaces be installed 3-6 months before prepping and staining. 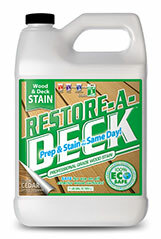 To prep new wood surfaces after the waiting period, use Restore-A-Deck Cleaner. It’s concentrated powder formula is cost-effective, easy to transport, and especially good at removing dirt, grime, mold, and mildew that is prone to showing up on new wood surfaces. Note: Kiln dried and KDAT wood still needs to weather after install. About 1-2 months. Rough sawn cut wood does not need to weather. After the new wood has been cleaned, the wood will appear slightly darker. 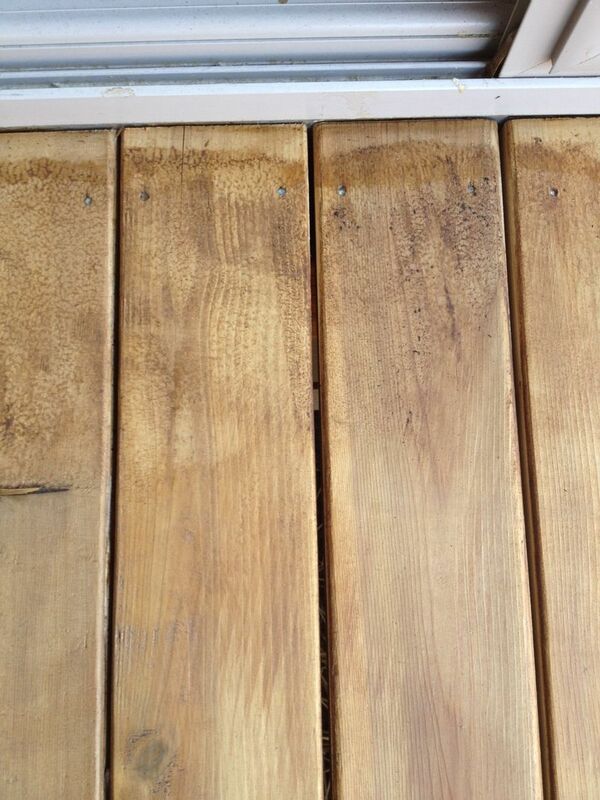 To restore the wood and neutralize the pH, use Restore-A-Deck Brightener to lighten it to its original appearance. The RAD Wood Brightener further opens the wood pores for an ideal surface to apply Restore-A-Deck Wood Stain. Following Restore-A-Deck Wood Brightener, continue with Restore-A-Deck Wood Stain. Unlike other brands of wood stain, Restore-A-Deck’s formula can be applied to wood surfaces following the Brightener on the same day on damp wood or can be applied to dry wood on following days. If applying to damp wood, it is recommended to allow the wood to dry 2-4 hours after prep is complete. Only 1 coat should be applied to new wood that is less than 9 months old. A light maintenance coat of stain should be applied 12-18 months after the first coat was applied. Every 2-3 years after that is normal. I had 13 year old mahogany deck railings pressure washed in June, and then sanded it with 80 grit. Pressure washing was forceful to get rid of built up mold/mildew. Should I treat the railings as new and only put on one coat, or can I put on 2 coats with wet on wet application. Do I need to use cleaner and brightener first. I plan to do the work in mid-September. The deck floor was replaced and will treat as new wood in September at the same time. Yes, you will need to clean and brighten for the prep. Just one coat of stain. Yes, wait 3+ months and do all the prep at once. In the process of treating a "new" deck that is about 10 months old. Used your cleaner and a power washer. Applied brightner. When the deck dried some areas became visible that had a white appearance. When scrubbed with water the white looks like its been removed, but after the wood dries it becomes visible again. Do I need to fix these areas before applying your cedar stain? If so how? Should I try powerwashing again with or without the cleaner? If so do I need to reapply the brightner? Any suggestions would be appreciated. Curious if you solved the white appearance and how? John, I repeated the cleaning/brightening process, this time using more force from the pressure washer. I was able to remove the remaining white. I am new to the whole deck maintenance routine, so I think I then did a pretty poor job of staining. Seems like I left a lot of "grit" that tended to pool at the end of my staining. At the ends I was up against the patio door on one end and the railing on the other. See attached picture. I mention this because I'm not sure if the "grit" was due to the fact that I still didn't sufficiently clean the surface. Or if there is something in the application technique that I am missing. I almost decided to clean again but then thought... well I'll have to repeat again next year anyways so I will see what happens then. I don't blame the product... I figure this is some sort of operator error on my part. Easy to do. Just apply the cleaner and pressure wash off the white oxidation. That is oxidation of the wood fibers from the sun. That will need to come off with the cleaner. Try to "scrub" a little harder while pressure washing to remove this. It should come off fairly easy. I don’t understand. “Weather”how long? Prep with what?? Hi-I am building a cabin and will use 6” beveled cedar lap siding (exterior). I want to cost both side of each board prior to attaching to walls. Is this ok or do I need to let it weather for months first? The siding will probably be laying outside in the summer for around a month before I’m ready to stain and install. You will need to let it weather and then prep. Cannot be prestained and you will only need to stain the wood that is exposed after install. Great...thanks! How much brightener and stain do I need? I have a 36x16 main deck and a 12x12 octagon deck below with two sets of stairs and railings all around. Two light coats equals ??? stain? Please use the deck stain calculator to the right of this comment. Below if on mobile device. I have a pressure treated pine deck that is 16 years old. It hasn’t been stained in over 10 years. I don’t know what type of stain was on it before or if anything was applied. I pressure washed the mildew away and the wood now looks great...almost like brand new and the wood is in great shape. What do you recommend that I do next? I have cedar deck, a year old. Do I just do the single coat, or two coats? Thank you! 2 Light coats applied wet on wet. With the every 2 to 3 year maintenance staining, do you need to strip the deck first or just clean it? You could do either. Most just clean and recoat. Have had T & G pine stacked for 15 years and am now sanding it with 120 grit sandpaper before applying it to soffits. Is your product compatible with my needs ? You are sanding it too smooth for a stain to soak in correctly. 80 grit is the finest it should be sanded. Where is this being installed? Can an airless sprayer be used? I have an older cedar deck (Age unknown, maybe 10 years?) that we are almost done sanding down to clean wood, and replacing a handful of boards with new ones. How should I handle finishing since I have a mix of old and new wood? Clean and brighten the wood for the final prep before applying a stain. Great! I was concerned I needed to let the 5 or 6 new boards weather in place for several months...which wouldn't be great for the newly sanded old wood. 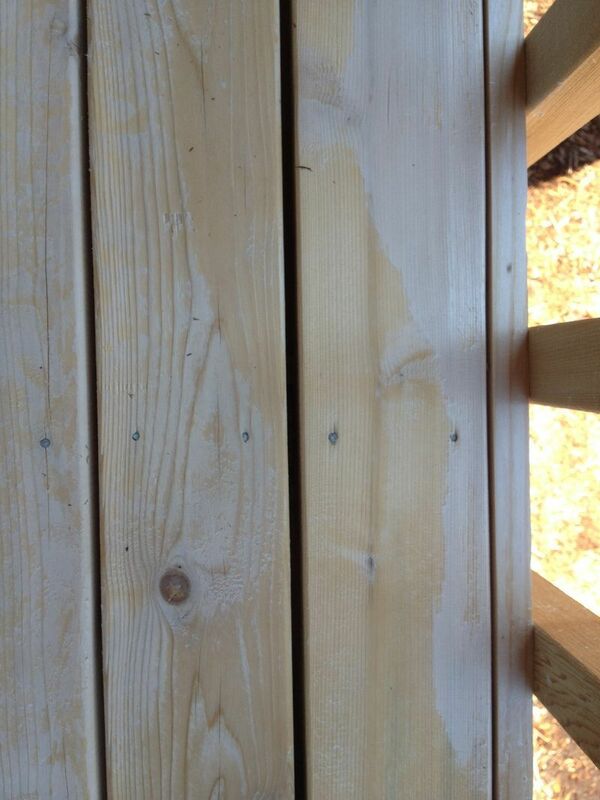 Have treated pine deck with 20 yrs of Sherwin Wms stains built up that were flaking and discolored. Used RAD stripper with power washer. Only about 20-30% of finish came up -- see pic. Should I keep applying stripper coats? If stripper only gets 50-60% up, should I sand the rest? or should I just sand down to bare wood now? If I sand, should I wait 3-6 months before cleaning and applying RAD stain? The build of SW is excessively thick and a stain stripper will not remove all of this so sanding will be needed. Sand with 60-80 grit and then wait about a month. Clean and brighten for the final prep. We have let our new deck weather ~ 12 months. Should we wait 12 months after the first coat of stain to apply the second coat? I have a new vehicular bridge with 4"x12"x13' full dimension pressure treated Douglas Fir decking. Would Restore-A-Deck be appropriate for this application? 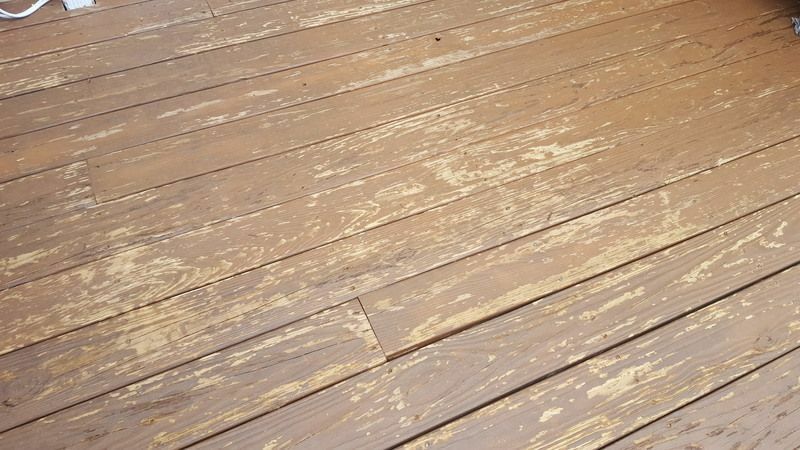 If so, how long should I let it weather before prepping and applying the Restore-A-Deck? I live in Texas and the bridge is in full sun. Yes, you can use this on this but take into consideration, if heavy traffic from cars, you will need reapplication sooner rather than later. Would this stain work as well right after sanding new(2 month old) redwood? No. If you sand, you need to weather again and prep with the Step1/Step2. Sanding is not a good way to prep as it will limit the stain's ability to properly soak in. You want the wood porous and a slightly rough profile for proper performance. If you recommend not sanding, then will the cleaner and brightener applications remove weathered gray UV coloration? I was going to sand to remove the gray coloration but is this not recommended or needed? I have a pergola made of white and red oak that has weathered for 12 months. Yes the prep products are designed to remove oxidation graying. Use a pressure washer as well with the cleaner.